I also like to create with found beach things. I made this charm bracelet for my mom with shells from the beach here we had found (they already had perfect holes in them). 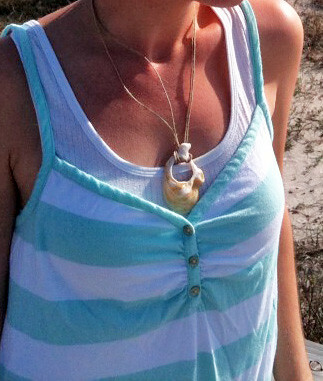 I also made myself a necklace with this shell I found. Not an amazing shell, but it was just perfect for a necklace so I couldn’t resist picking it up. Our mornings are filled with special beach trips, especially right now before it gets sweltering hot. I am cherishing all of these wonderful moments with my daughter. If you have a child, what are some things you are currently doing with them that just makes your day? Love the beach!!! I miss it; I havent been in a really long time! We’ve just been enjoying getting outside to play. The beach sounds wonderful! i love to just sit with them all over me and read a story! Tucking in at night…lots of kisses, cuddles, hugs, and more kisses! Bed time is sweet. The beach / ocean brings fond memories of my grandmother. We spent many hours there watching the boats as we walked in the sand. One of my daughters has carried on our love of the water and has amassed a beautiful collection of seashells she collected as a young girl. Thanks for the memories. I feel so fortunate to live near the beach too! My daughter just turned two and is finally old enough to really enjoy it. We’re also enjoying it before it gets way too hot! Oh, how I love the beach! I wish we live close to one. What makes my day is waking up in the morning, taking in the sweet sleepy aroma of my kids hair and skin, hugs and saying good morning to the Sun, Sky and to the loving Earth. What also makes my days is when I take the time to actually pause, to stop and listen or just watch my children and get to see the world through their eyes. It is a blessing. Oh the beach…I am dreaming here. COol finds! Is this the first time your husband has deployed since you’ve had your daughter? My husband deployed when my daughter was 13-17mons old and I feel like she and I created such a strong bond through that time. I hope all is well for you. Dreaming I could be near a beach! The closest I can get is Lake Michigan and that isn’t too pretty… I am amazed by your bracelet! I love it! I live blocks from the water and yet I do not take advantage of it like I should. We are moving soon, only 14 miles away but I will not be this close to the beach. I may have to pack up some food for my girls and go today. I am inspired! 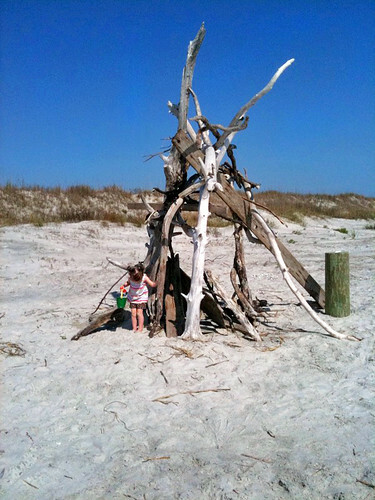 We live on the beach so we do alot of walking, playing, digging, and we make driftwood tipees. 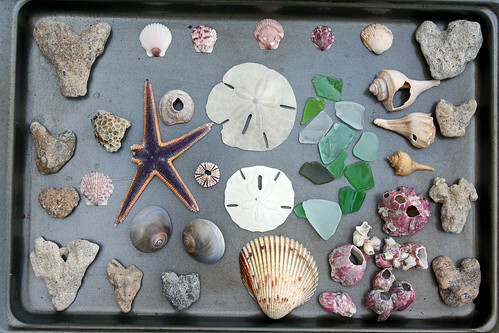 Seaglass is our favorate thing to find. missing the beach this summer. We’ve lived in Indiana for 7 months (but were in Clearwater, FL before), but my almost 3 year old keeps asking for the beach. These days we keep busy playing in the backyard. all day! Your necklace is super cute! That was a great idea. Too Cute! Check out my blog for some sunshine sent your way! Love all the crafts you made! I love the beach! Have a great day! The warm weather and beach looks wonderful! I live in Utah where it snowed yesterday….Drat. I love following your blog and getting great ideas from you. My favorite moments with my kids are in the mornings, my daughter wakes up and climbs in bed with my husband and I. We love having special cuddle time with her. My little boy is especially wiggly so the only time I get to cuddle with him is in the middle of the night when he wakes up…hey! I’ll take it when I can get it. Oh man… I love the beach and I haven’t been in at least 10 years!!! It’s something that calls the soul. 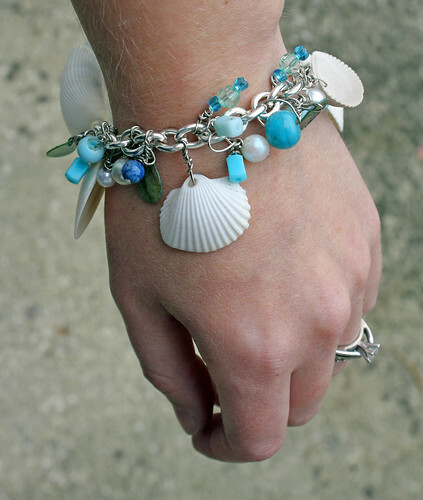 Love the shell bracelet! You just have the “awesomest” ideas! So I just found out why some shells have those holes in them…Moon Snails, Whelks (another kind of sea snail) and even octopuses drill them to eat the clam! Such a great idea for a charm bracelet and I love the necklace too.